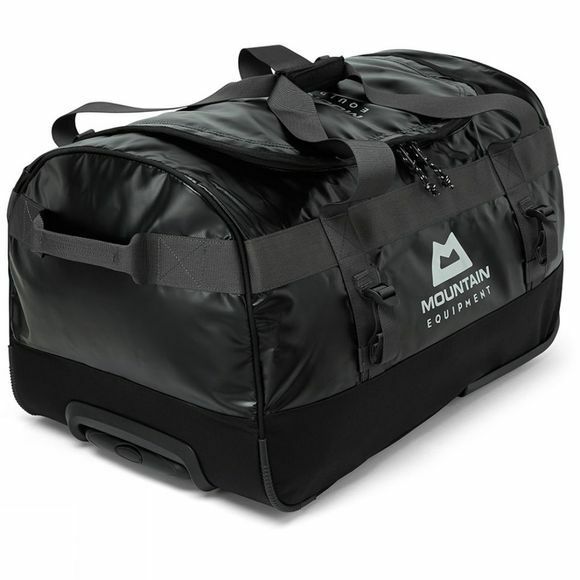 This extremely robust travel Kit Bag with wheels from Mountain Equipment is made from tough waterproof, tarpaulin fabric for challenging adventures and expeditions. It includes a large internal mesh pocket with a clever water resistant divider so wet and dry clothes don't mix on your travels. The lockable pull-out handle and wheels provide ultimate practicality, making it ideal for expeditions, ski trips and trekking adventures that include flights abroad. In addition, reinforced carry straps and handles mean that this is a versatile luggage option and compression straps are great for stabilising your gear for the longhaul. While the fabric used is waterproof to keep a lot of water out, the seams are not taped and the zip is not waterproof, therefore this cannot be considered a fully waterproof bag.